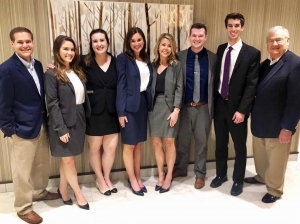 LSU Law’s John R. Brown National Admiralty Law Moot Court Competition teams of coach Phillip Smith, Hannah Crosby, Sarah Day, Sarah Simmons, Katelyn Bayhi, Jacob Cunningham, Michael Maldonado, and coach Dean Sutherland. LSU Law’s traveling moot court and trial advocacy teams enjoyed another weekend of great success from March 29-31. The Law Center’s Gold team of Hannah Crosby, Sarah Day, and Sarah Simmons placed runners-up in the national John R. Brown National Admiralty Law Moot Court Competition in Charleston, S.C. In addition, the Purple team of Katelyn Bayhi, Jacob Cunningham, and Michael Maldonado placed as national semifinalists. LSU Law was named the competition’s Most Outstanding Law School for placing two teams in the top four. Maldonado also won third place Best Oralist. The team is coached by Adjunct Professor Dean Sutherland (LSU Law ’75) of Jeansonne & Remondet and Phillip Smith (LSU Law ’16) of NeunerPate. 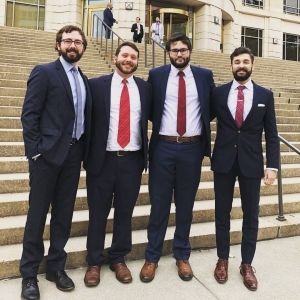 In the school’s second appearance in the competition, LSU Law’s Manfred Lachs Space Law team of Keith Mikesell, Marcus Sandifer, and Jordan Varnado placed as one of the top four teams in North America this weekend at the North American regional rounds of the competition in Washington, D.C. The team is coached by LSU Law 3L Zachary Miller. 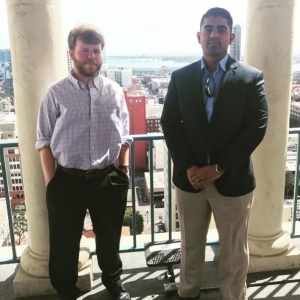 Students Justin Spears and Benoy Sanil competed in the National Sports Law Negotiation Competition in San Diego. The NSLNC team is coached by Advocacy Fellow Annie Scardulla, with the assistance of student coaches Hunter Hewell, Anthony Hewitt, and Michael Schimpf. Zachary Miller, Keith Mikesell, Marcus Sandifer, and Jordan Varnado at the Manfred Lachs Space Law Moot Court Competition. 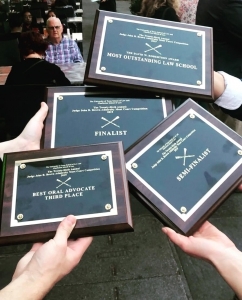 LSU Law’s teams placed as runners-up and national semifinalists, the school was named most outstanding Law School and Michael Maldonado also won third place Best Oralist at the John R. Brown National Admiralty Law Moot Court Competition.